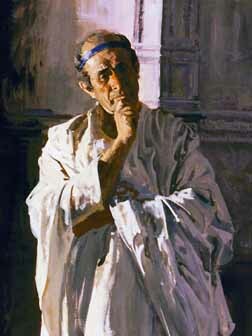 Pilate stared fixedly at the basin of water resting on the ledge of the balcony adjoining his audience chamber. After long moments of silence, he turned and glowered at the young centurion who stood uneasily before him. "I want the truth about what happened our there, centurion, and I mean the truth! Not what some Jewish jackal paid you to say!" "Yes, sir," the centurion replied, his mouth suddenly dry. He himself still couldn't believe what had happened. It all seemed so bizarre. But then Passover time in Jerusalem always baffled a Roman. Even the duty assigned to his unit-guarding a tomb-was odd, though his commander had explained it to him just hours ago. "You have the area secure, centurion?" "Yes, sir. Ten of my best men stand watch at the entrance. The rest are scattered among the rocks in case of a surprise attack." "Well done. The Man in this tomb had many supporters who might try to steal His body and claim a resurrection. That could pose a real problem for us." "Pardon me, sir, but how could this Man's 'resurrection' threaten Roman control? He is only one Man, after all." "Sometimes it only takes one man, centurion. I'll explain the politics of this situation to you. The Man in the tomb, a Teacher called Jesus, appeared about three years ago. His open opposition of many Jewish religious traditions angered the leaders and priests. "He even had the gall to use the holy name 'I AM' reserved for the Jewish God, Yahweh, and He used it to refer to Himself! That's nothing short of blasphemy to a Jew! 'I AM'-now what kind of name for a god is that? But at any rate it whipped the religious leaders into a frenzy. Since we control the populace through those same leaders, a threat to them spells a threat to us. "Another thing, centurion. This Teacher's followers believe Him to possess power over death. In fact, He once claimed that He would die and rise again. By stealing the body His followers could perpetuate the fable. They could even encourage others to believe that they, too, can be raised from the dead. Can you imagine facing an army of zealots and seditionists who sincerely believe that they can be raised from the dead if killed in battle?" "I see what you mean, sir. Perhaps I should request reinforcements." "You have enough men for the job. Unless, of course, this Teacher is the Son of God, as He claimed at His trial. And in that case, the entire Roman Empire wouldn't be able to stop Him." Noticing the grim expression on the centurion's face, the Roman officer laughed. "I don't think you have to worry, though." The watch proved long and weary. yet the centurion and his men remained vigilant. Each soldier knew only too well what a Jewish zealot could accomplish if even one guard failed to do his duty. The eerie silence of the tombs didn't bother the centurion. He was not superstitious. Still he felt sure a time or two that he and his men were being watched. The soldiers moved about, casting wary glances into the shadows. A few minutes before daybreak on the third day, the centurion detected a rising wind, fresh and clean. It differed from the normal breezes full of dust and the city's stench. He stood beside the fire and warmed his hands. Then he caught the faint sound of wind chimes drifting on the wind. His hand on the hilt of his sword, the young centurion advanced in the general direction of the sound. A pure, clear beam of surprising brightness pierced the overhanging clouds above and formed a circle of radiance among the black rocks of the tombs. Startled, he halted, then backed slowly away as the light grew in intensity and pushed back the darkness. Alerting the rest of his men. the centurion fell back with the soldiers at the tomb's entrance. He unslung his shield, strapped it to his arm, then slipped his sword from its scabbard. The blade gleamed in the firelight. Swords in hand, shields raised, and spears ready, the centurion and his men waited. The fear gnawing in their stomachs mounted with every second. The strange light that had been slowly growing brighter suddenly flashed in brilliance. It flooded the area in awash of light. His men staggered as though physically struck. A few reeled backward and collapsed. Others pitched forward into the dust, their weapons clattering useless onto the rocks. The centurion felt the air squeezed from his lungs. Unable to grip his sword, he let it fall. Incredibly weak he dropped to his knees and, just managed to hold himself upright by clinging to a nearby boulder. Before their eyes the intense light took on shape, depth, color, and became a man. Despite the light swirling about him, his features were unmistakably clear. The centurion could not look away from the man's eyes. A quiet strength and innocent wisdom radiated from them. This being of stately bearing possessed obvious power. The man strode purposefully down the path. Stepping carefully over the fallen soldiers, he moved past the centurion and stopped at the tomb's entrance. Though the man said nothing, the centurion suddenly felt the ground beneath him begin to sway and tremble. A dull rumbling filled the air. Accompanied by deafening thunderclaps, jagged tongues of fire etched cracks across the black sky. The massive covering stone-sealed with the signet of Rome-trembled and then was heaved aside, the seal ripping apart and exposing the open entrance to the tomb. "What kind of man is this!" the centurion gasped inwardly. Only then did the man speak, in melodious tones that hinted of awesome power. "Son of God and man, Your Father calls You from the sleep. In the name of God, come forth!" An answering light flooded the tomb's interior, and seconds later another Man appeared-the Man who'd been buried there only the third day before. Unable to move or to speak the centurion could only stare helplessly. He could make out the wounds in the second Man's hands, the marks of a Roman crucifixion. We're dead, the centurion thought. He won't let us live after what's been done to Him!" The earthquake and lightning died down as the two men conversed quietly. Then the Teacher, Jesus, looked at the centurion with a gaze that swept his soul bare-penetrating, revealing, yet uncondemning. He spoke. "Tell them, I AM." The centurion bowed his head to escape those searching eyes. When he found the strength to look up again both men were gone and the tomb lay empty. In the east the first rays of the morning sun crept into the sky. "And you came directly here to report, centurion?" Pilate asked with a sneer. "No, sir," replied the centurion. "On our way here a Temple messenger intercepted us and summoned us before the chief priests. They wanted to know why we no longer stood watch at our post. We told them what we had seen, but they tried to explain it away." "We saw what we saw. We cannot change that." "I imagine the priests were very upset at your news. "Yes, sir. They offered us large bribes to tell you that we had slept at our posts and that His followers had stolen the body." "You are aware, of course, of the consequences for dereliction of duty?" "Yes, sir." The centurion swallowed. "But Caiaphas offered to intercede with you in our behalf." "So you accepted the bribe like a good Roman," Pilate mocked. "Yes, Caiaphas came here and told his little fable. But why did you choose to tell me the truth?" "For two reasons, sir. I fear you more than I fear Caiaphas..."
"...and because He told me to tell you." "Who did?" Pilate asked, his face suddenly ashen. "The Teacher, Jesus. He said, 'Tell them, I AM.'"